Bicycle commuters and others interested in non-motorized public transportation got a chance on Tuesday to kick the tires and go for test rides on three bike share systems that may one day be a common sight on Seattle streets. King County is sponsoring the presentation, which will be repeated in Redmond on Wednesday, to get some feedback about what people like and don’t like about the bike share programs and how they could be employed here. Participating in the all-day display on Westlake Avenue were B-cycle, Bixi and The Bike Share Group (left), which is based in Ballard. 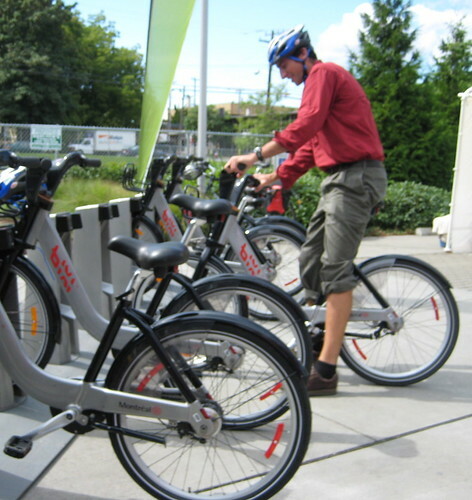 Only one of the systems, the Bixi, is undergoing daily public use. It’s the bike-share system for the city of Montreal, which launched the program this spring. The program started with 3,000 sturdy bicycles and is expected to have 5,000 on the street by the time it shuts down for the cold Quebec winter. Users can either swipe a credit card for single use, or become members and use a “key” to unlock their bikes for more frequent riding. The fee system is set up for short trips. Although the bicycles are built locally in Montreal, the Bixi is expanding to California. It’s already preparing a contract with the city of Newport Beach and the University of California-Irvine. Showing a prototype at the expo was The Bike Share Group, based in Ballard. 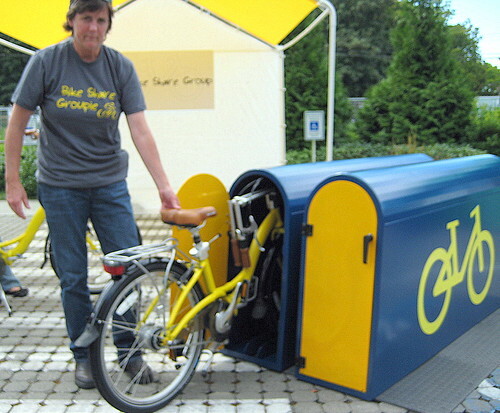 The group, led by Mark Hulscher, is creating a community-based bike share system that uses folding bikes that are stored in low-profile metal bike boxes. That’s a departure from other designs that use kiosks. Keeping the bicycles in boxes reduces problems associated with weathering and tampering, they said. Instead of a credit-card swipe activitation, they’re studying membership cards or RFD cards. Another “low-tech” option is simply have the user call a phone number and get the combination lock number to open the bike box. The group’s website is thebikesharegroup.com, although it’s still under construction. The other bike share system on display was a collaboration of Humana insurance, bicycle-maker Trek and advertising agency Crispin Porter + Bogusky. This bike share system is an outgrowth of Humana’s Freewheelin program in 2008 that put people on bicycles at the Democratic Convention in Denver and the Republican Convention in Minneapolis. 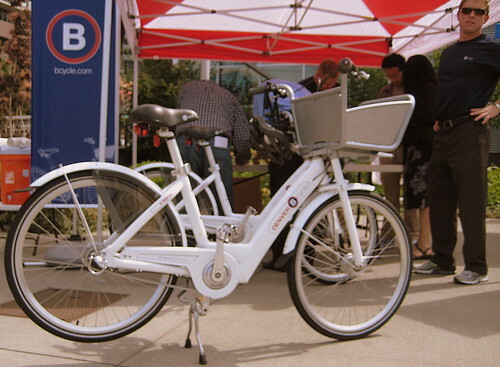 The B-cycle program is undergoing a test phase with city employees in Denver this summer and is expected to go public in April 2010 with 600 bikes. A bike share program will be launched next spring in Minneapolis as well. National Park Service employees in Washington DC are using the B-cycle program as well. King County is hosting another Bike Share Expo in Redmond on Wednesday from 12 to 8 p.m. at the Redmond Town Center, 76th Street and 166th Avenue. Whether any of these systems see the light of day in Seattle remains to be seen. More than 100 cities around the globe now have bike-share systems, so having one show up in Seattle seems inevitable. We certainly welcome the day when people can hop on an easily accessible rental bicycle and ride it on a business or personal errand. The possibilities are endless.